A Turkish meal usually starts with a thin soup (çorba). 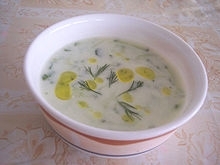 Soups are usually named after their main ingredient, the most common types being; mercimek (lentil) çorbası, yogurt, or wheat (often mashed) called tarhana çorbası. Delicacy soups are the ones that are usually not the part of the daily diet, such as İşkembe soup and paça çorbası, although the latter also used to be consumed as a nutritious winter meal. Before the popularisation of the typical Turkish breakfast, soup was the default morning meal for some people.